Although I don't hear the phone ringing in my front shirt pocket, I can feel the vibration. The combination of the noise cancelling headset covering my ears and the noise and vibration of the engine don't allow me to hear the phone, but the vibration of the phone is much to unique to mistake for anything else. I look down the runway. My hand is on the throttle, ready to advance it and send my tiny craft hurtling into the air. The vibrating in my pocket causes me to hesitate. I know who it probably is, and I should at least have a look. The caller ID on my cell phone tells me that I should indeed answer it. Answering my cell as I sit on the runway ready to launch is not something that I have ever done before, but I have a suspicion that this time it will be worth it. I'm right. It's our operations (ops) manager on the line, and I slide my phone underneath my headset so that I can almost understand the voice on the other end of the line. It's a good thing that I answered the phone. He's just talked to the people at my destination, and the news isn't good. A large storm moved through the area last night, making the airstrip unusable for now. We will have to wait at least two hours and have a look at our options then. I hang up, sigh, and try to come up with a nice way to tell my passengers why we are now taxiing back to our parking spot instead of winging our way westward. It is 7:30am. Time has been rolling by this morning like a herd of turtles. It is now 10:30. Approximately every half hour I have been on the phone talking to the ops manager to find out what the current conditions are like at our destination. The problem, along with the runway conditions, is the cloud cover and visibility. We are hoping to make our way to Bundibugyo, a small village in western Uganda, located just across the Rwenzori mountains directly south of Lake Albert. Right now the visibility is marginal at best which is a problem as the airstrip is located only 2-3 miles from the mountains. Being able to see the mountains when I get there is hugely high upon my list of priorities. We're approaching that time of day when thoughts of having to cancel the flight begin to swirl through my mind. I am supposed to fly these three people in, then fly them back out again that evening, as they all have flights tonight. One is flying back to Ethiopia and the other two are headed back to the USA. The lady that I am bringing in is going to be doing a home study for a missionary couple there who are trying to adopt an Ethiopian baby. The other two gentlemen are headed for the hospital there to have a look at the viability of helping out the hospital with eye care in the future. My phone vibrates in my pocket again. After some discussion, we decide that I should give my passengers the choice of cancelling the flight right now and being able to get a full refund for the flight, or we can go and see how the weather and airstrip look first hand. Without hesitation they all tell me, "Lets go now!" We load back into our little plane, and this time we do launch into the cloudy blue skies. As was anticipated, the weather is fairly clear and there are no issues until we get about 60 miles away from our destination. As we approach the mountains we are flying over most of the clouds. Usually this means that the air is smoother and often I can see further up there as well. This is great, but this time I know that there is cloud cover at my destination and I figure that I should get below the clouds while I still can. I circle down through a nice hole in the clouds and continue westward. As soon as I get beneath the clouds the visibility drops significantly. Now I am headed westward toward mountains in very poor visibility. My "spidey senses" begin to tingle, and I make a decision. Banking my airplane to the left, I make a 180 degree turn and head back. When I reach the hole in the clouds where I descended, I add power and climb back up. As we climb above the clouds I am surprised at what I see. In the few minutes that we have been below the clouds, things have changed above for the better. I turn to the west and keep on going. Soon I see the mountain tops in front of me. This range of mountains runs from the north to the south. North of my position the mountains are significantly lower and to the south they rise too high for me to climb over them. This is all well and good but for one thing. The ridge tops are shrouded in cloud. Clouds that loom above us and also hide the tops of the mountains in the mist. This is what I had been fearing the whole flight over. With so much moisture in the air it was almost inevitable that the rising air currents at the mountains would generate clouds like this, and it has happened. I extend 20 degrees of flaps and slow my airplane down to the MAF "mountain flying" configuration. This gives me the most amount of maneuverability as well as slowing me down, giving myself more time to make decisions about what I am seeing in front of me. There is a cloud bank that will not let me head north toward lower terrain, so I again bank left and head south. The ridge tops are higher here, but there are also numerous valleys which may afford opportunity for me to cross the mountain range below the clouds. Alas, it is not to be on this day. The further south we go, the worse things look. I turn around again and head north. I am able to go a few miles further north than I had been, but through my windscreen I now see that the clouds are not going to allow me to go much further. It's time for me to make a choice. I am about 4 seconds from calling it a day and heading back to Kajjansi airfield when we come around a cloud and I see a beautiful lane leading the way westward. Beneath me I can see the tops of the mountains clearly. I can also see all of the way to the valley floor on the other side, which is good news. This means that if there is still cloud above the airstrip I will be able to descend below the clouds here and be able to get a look at the strip. As an added bonus, visibility on the other side seems to have improved as well since our last update. I make a position report to our flight follower over the HF radio, and receive more news. The people at the airstrip have driven up and down it and have placed several brightly colored buckets on the airstrip to mark the wet, soft sections of runway. This is something that is totally unexpected for me, but I am very thankful for it. Over the mountains we go. The opening in the clouds is only about 1 mile north of the airfield, and as I think of all of the things that have allowed us to get this far, I wonder if there are people praying for me right now back in Canada. This is all too much for coincidence. When we crossed over the mountains we were around 10,000 feet high, and now we need to descend. Visibility at our altitude is not great, but is adequate. As we descend the visibility improves and when I finally pass over the airfield at 1,000 feet above ground level I can see for upwards of 15 miles. "God, it feels to me as though people are praying for us right now. If you could lay it on their hearts to continue to pray for the next 10 minutes I would greatly appreciate it. Give me clarity of thought as I have a look and decide if we can land safely here. Keep me from feeling pressured to land here just because we have made it this far." Once again I slow down my airplane. One by one my checklist items are completed and I am ready for for a low pass. 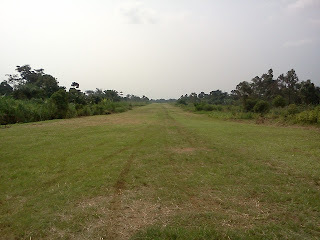 This airstrip is a one way airstrip. This means that I land one direction (flying towards the mountains) and take off the other way, away from the mountains. It also means that when I am still airborne, just above the tree tops on my final approach, I am committed to landing. At that point there is no alternative, no "add power and climb out" option, since there are mountains looming off the end of the airstrip. I do have enough room to do a low pass though. If I hug the mountains as I descend, I can get down over the landing site from the mountain side of the field and have a good look from only a few feet above the runway. Landing this way is an option when the conditions are absolutely favorable, but today is NOT one of those days. I slowly descend and make a steep approach for the runway. Leveling off at about 10 feet above the runway, I add power and accelerate as I look over the nose of my aircraft at the wet, grassy landing area flashing beneath my wings. I have been here several times before, and the area that they have marked out with their buckets is exactly where I expected it to be. There is one other section that looks a little wet closer to where my wheels would touch down, but it appears that the ground there is quite firm and I don't think that I will sink into the mud there when I land. Again I am faced with a choice. With all of the knowledge that I have been able to collect up to this point, I decide that yes, I can safely land here. I add power and climb away from the airstrip, giving myself room to set up for a smooth, accurate approach to the spot which I have picked out on the ground for my wheels to touch down on. Mentally I go through what I hope to do in the next few seconds; "Smooth, consistent approach. With current weight, landing uphill, wet ground, approach at 60 knots. Raise nose, add power to soften landing. When wheels touch down, add throttle and keep the nose in the air to keep the aircraft from sinking into the soft ground. When past the soft area; reduce throttle, lower nose and slow down well before the end of the strip. Taxi up, turn around, and shut down the engine." Once again, all of the training that I have gone through and preparation over the years comes to mind as my brain goes into an ultra aware, hyper vigilant state. My approach is very good. Airspeed is settled right on the mark. Tiny, incremental adjustments of the throttle keep me on my glide path. I skim over the tree tops. "Committed to land." There's no going back now. The ground rushes up at me and details begin to emerge in the landing area in front of me. Pulling back on the yoke, I slowly bring the nose of the airplane up. It's interesting what can flash through your mind in a time like this. "I CAN"T BELIVE I"M DOING THIS! Only other mission pilots have these experiences, right?" Softly my wheels nestle into the grass. Immediately I can feel the wetness of the runway, but it is firm. Adding power, I keep the nose wheel off the ground and splash through the first of the wet areas. I have my "line" picked out ahead, where the ground looks most firm and I would ideally like to pilot my plane. The softest area is upon me and I feel the wheels begin to slide sideways a little as the mud grabs hold of the tires. My days of flying a tail-dragger aircraft stand me in good stead and without even thinking about it I advance the throttle even more. This gives me more airflow over my rudder, which results in more directional control. Somewhere in my subconsciousness, I am aware of mud and water splashing up and hitting the underside of my wings. Although the mud is trying to slow me down and make me good and stuck, it no longer feels as though I am slowing down. Sure enough, I've come through the worst and I reduce the throttle as I climb the dry, firm slope to the parking area. "Fox-Fox, Mike-Sierra-Yankee is on the ground, Bundibugyo." I swing around, set the parking brake and shut down the engine. The adrenaline coursing through my veins is causing my hands to shake like a rookie hunter after bagging his first deer. I take my first breath in what feels like a long time. Pulling my headset off of my sweaty head, I turn to my passengers with a smile, "Welcome to Bundibugyo!" The military police are waiting for us and are ready to guard my airplane for the next few hours until we leave. This means that I won't have to sit there with the airplane all afternoon, but I will be able to leave the airstrip and have a look around. The missionary couple who is having the home study done invites me to come with them and I gladly agree. The road conditions are very similar to what the dirt roads in and around Kampala are like. We average about 20 to 30 kilometers per hour as we make our way to their home. The road is surrounded by grass which is higher than the vehicle, and the mountains rising to the east add to the ambiance. The next few hours are highly enjoyable, and I am able to visit and learn a little about life outside of Kampala and the work that these people are doing. We have a fantastic lunch, and after more visiting it is time for me to head back out to the airstrip. Arriving at the airstrip, I can tell just by looking that the last few hours have been kind to the strip. 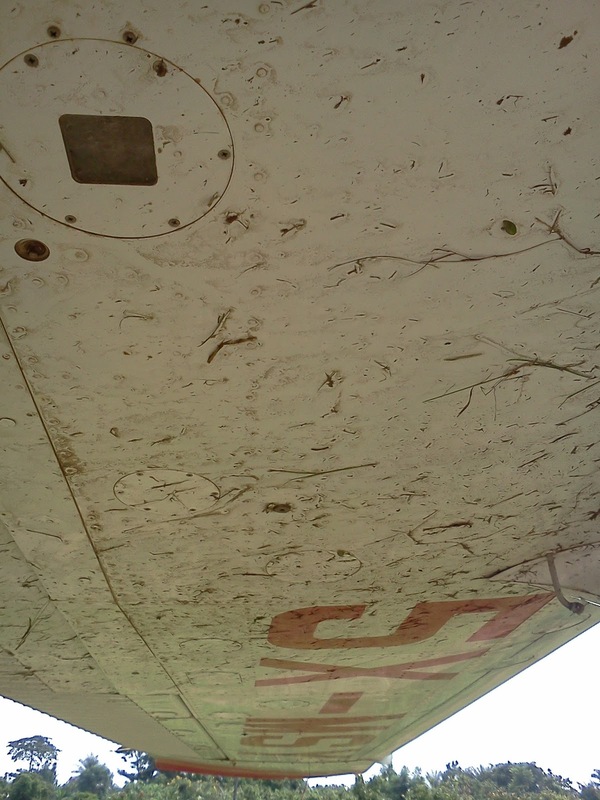 It looks even more dry and firm than when we landed. I have arrived about 1.5 hours before departure time, and I take the time to walk the airstrip, seeing up close with my eyes and feeling with my feet the condition of the ground. Once again, I pick out my ideal line for take-off. The strip conditions have improved enough I am not worried about take-off at all. After preparing the aircraft for flight and ensuring that all is well and ready for departure I have the time to sit and read a book for a few minutes. As I sit enjoying my book, I almost miss a slight rumbling sound coming from the east, but as the sound makes its way through my consciousness I look up towards the mountains. What I see makes me forget my book. The sky over the mountains is turning a dark blue, and although the rumblings coming from the clouds do send tingles down my spine, it is not a good sensation. Thunder. Rain. Oh boy. As I observe the movement of the clouds, I guess that we have 30 or 40 minutes before the rain comes and we end up spending our night here. This wouldn't be a big deal for me, but it would mean that all three of my passengers would miss their flights. We had agreed that we would try and meet back at the airplane at 4:00pm. As 4:00 came and went with no sign of my passengers, I tried to settle my nerves. About 10 minutes later I heard a vehicle approaching and sure enough, it was the first of my passengers. Two minutes later the other two showed up as well. After a quick farewell, we piled into the plane and started up. Take-off went very smoothly and as we climbed up away from the mountains and the clouds my blood pressure went down and I began to breathe easier. I knew that we'd have to head north for a while before we crossed back over the mountains. Getting around the clouds and back over the mountains went well, and the flight home seemed that it was going to be smooth sailing the whole way there. For a while it seemed like the hard work was done for the day, and then my radio started talking to me. "RM, this is SY, go ahead." "SY, I'm just headed in towards Entebbe and I'm seeing several cells that have popped up on my weather radar. You might have trouble getting back in to Kajjansi." "OK, thanks for the info. I'm still about an hour out, so a lot could change before I get there." "That's true. I'll keep you informed." As we continued our way eastward, radio chatter around the Entebbe area picked up significantly. Many different planes requesting different altitudes and different routings because of bad weather that they were experiencing. Then our flight follower came on the radio to tell us that the weather in Kampala was very poor, with lightning and thunder accompanied by torrential rains. At this time RM was attempting to find a way through the storms to get into Entebbe. He was coming in on an international flight, and as such he had to land at Entebbe. I had a couple more options, but not a lot. As he picked his way through the clouds, he advised me that the storm cells were still growing and from what he was seeing on his radar I would probably have a greater chance of success if I went north around the storms and came into Kajjansi from the east instead of the west. At this point I could see the dark clouds ahead, and I began to make my move to the north. At one point as we skirted the north edge of the storm we were about 20 miles north of where we were supposed to have been. It was a huge storm. As I piloted my airplane around the north edge of the storm, the dark, ominous grey-blue skies that were south of us began to lighten up. I made a slight turn to the south, and before I knew it we were tracking directly towards Kajjansi again, this time from the north rather than from the west. My GPS told me that we were about 17 miles away from Kajjansi, and I was beginning to have hopes that we had successfully made our way around the storm. We continued in, and about 14 miles out the skies began to darken again. This time the skies were an ominous, threatening line that stretched either direction in front of us as far as I could see. The lower clouds forced me to descend, and I was only able to level off about 1,000 feet above the ground. This may sound like a lot, but the terrain here is very hilly and I was needing to go over the city of Kampala, which has buildings and radio towers on top of many of the hills in the city. Couple this with the reduced visibility (about 3 miles) and the occasional lightning flash on either side of me, and I was sweating again. Looking ahead, there were two things that gave me comfort. One was that as I made my way through the rain, I constantly took a course which brought me through the lightest blue skies. This is not to say light blue skies, only skies that were slightly less dark than the ones around them. The other thing was that I was approaching Lake Victoria. One thing that I have quickly learned here is that during the day there are almost always no clouds over large bodies of water. This meant that as I made my way south through the rain, if I could make my way out over the water I would be clear of the clouds and be able to follow the shoreline westward until I came upon Kajjansi or Entebbe, both of which are on the edge of the lake. Sure enough, just as I began to make out the shoreline through my rain streaked windscreen, the visibility began to improve. I made a turn westward, and in a few minutes was able to see Kajjansi through the lessening rain. As I approached Kajjansi from the east, RM was making the flight from Entebbe to Kajjansi from the west. As RM landed and taxied off the runway, he radioed me again to let me know that the runway was wet and there was a little standing water on it. For the last time that day, I went through my landing checklist, being careful to be deliberate about every action and to not allow the excitement of making it back home lead to a last second error. My approach and landing were very nice. I think some times that it is in these high stress situations when I often end up with the nicest landings. I think it may be because the situation forces me to focus and bear down even more than what is normally required, leading to very smooth landings. "Fox-Fox, this is SY, on the ground, Kajjansi." "Copy, SY, on the ground, Kajjansi. Good work today." Thank you also, to all of you who regularly pray for us. There are times when everything goes just right and I wonder how many of you are praying at that exact instant. It is a lot of fun to be able to fly and talk to so many people about what God is doing through their mission or in the lives of the African people around them. I love being able to support them through the flying of an airplane. We wouldn't be here without your support. If you would like to see the video of the landing and take-off that I described in Bundibugyo, you can see it on my facebook time-line. The proper order of events is "Fly Over" followed by "Wet Landing" and then "Take Off". It was filmed by the missionary there who I spent the afternoon with.